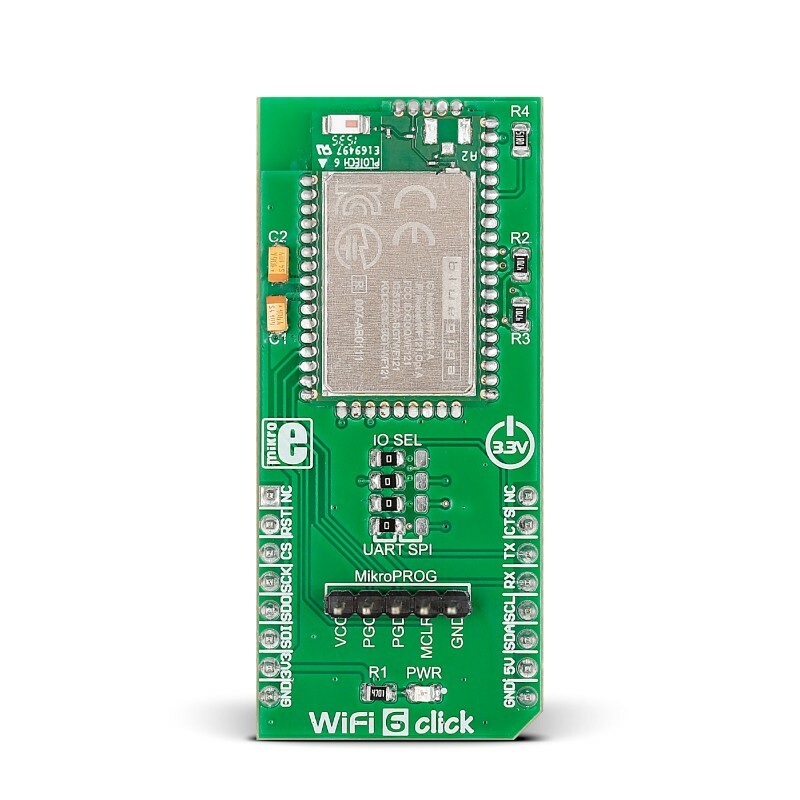 WiFi 6 click features Bleugiga’s WF121-A self-contained WiFi module. 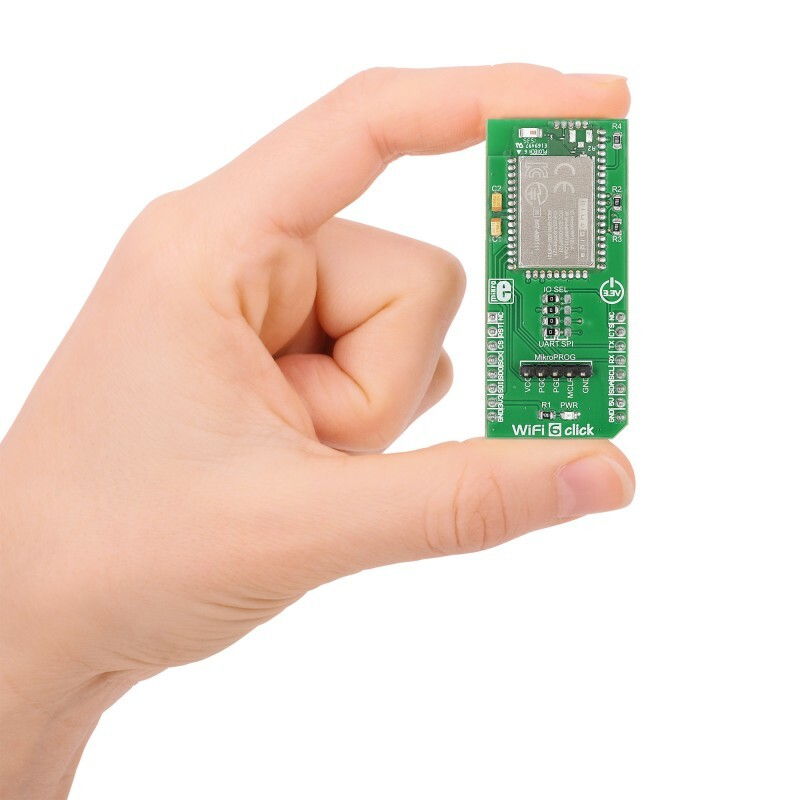 With a fully integrated radio and 32-bit microcontroller, this module is ideal for embedded applications. 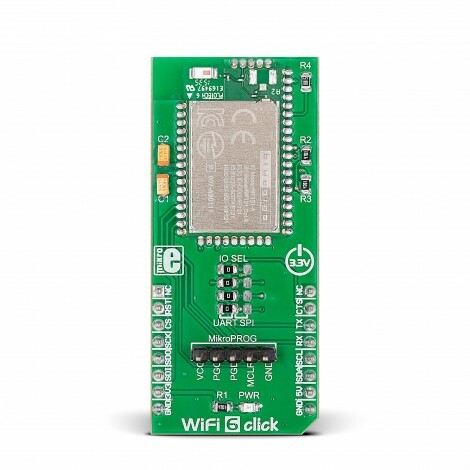 WiFi 6 click is designed to run on a 3.3V power supply. 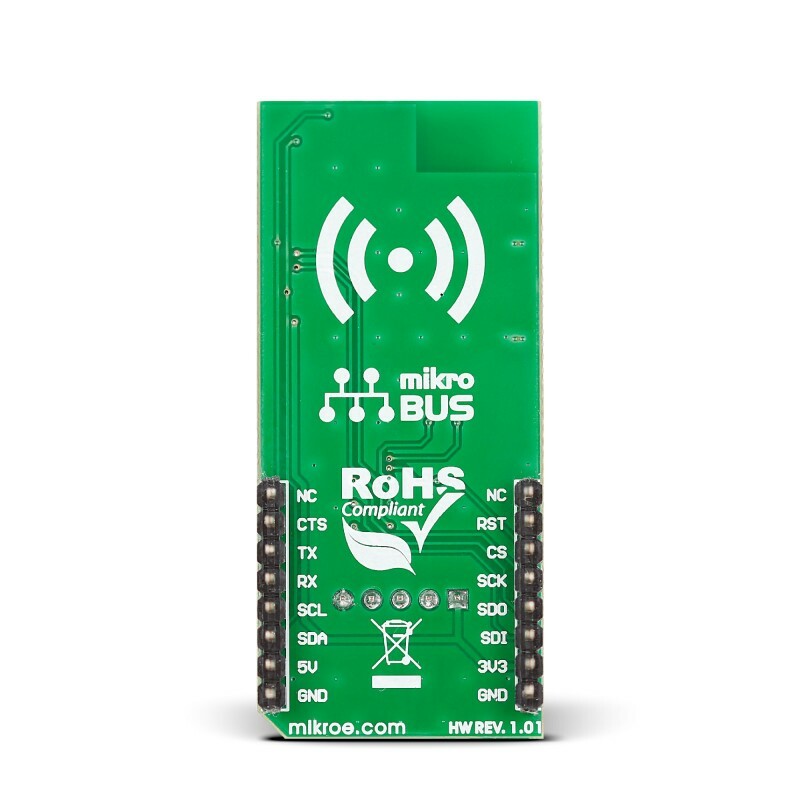 It communicates with the target MCU the mikroBUS™ UART (TX, RX), SPI, or IC2, with additional functionality provided by CTS pin (in place of default mikroBUS™ INT pin). SPI interface can be accessed by jumpers on the click board. A mikroProg connector allows to update the firmware of the internal PIC32. The module’s 2.4GHz band radio is fully compliant with IEEE 802.11b/g/n and offers excellent radio performance. 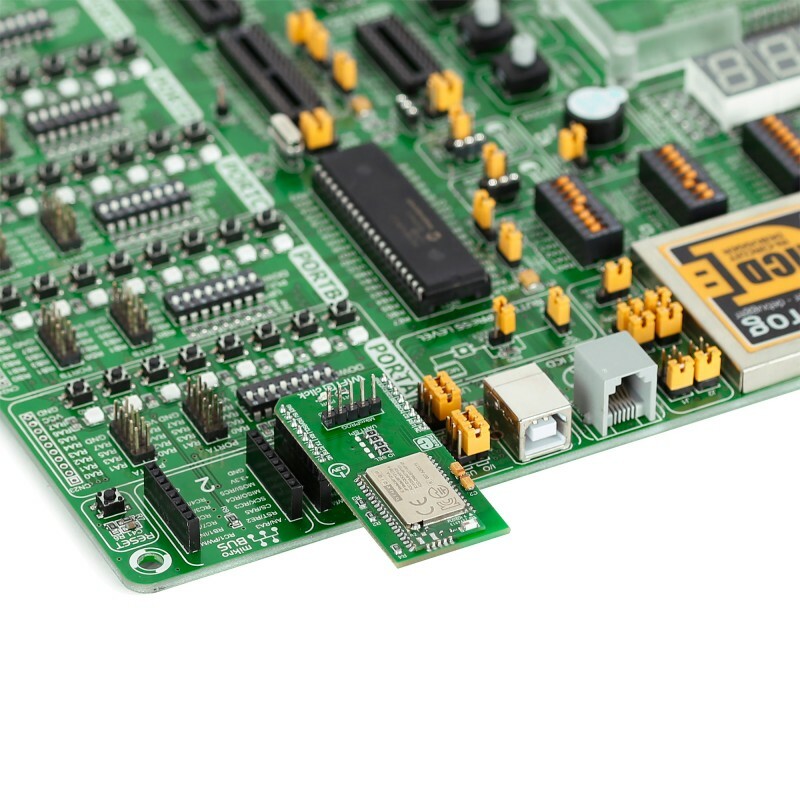 It allows the end user applications to be embedded onto the integrated PIC32MX695H, a 32-bit 80MHz microcontroller with 128KB RAM and 512KB Flash memory, for development of lower-cost and smaller sized products. Also, integrated on-board is a single power supply. In WiFi client mode, the WF121 radio core automatically powers on the RF circuitry only when needed. The WiFi core processors support automatic sleep modes when not communicating actively, allowing very low idle consumption. When used as an access point, the radio core must receive constantly and cannot enter sleep modes. The integrated firmware provides WiFi and networking stack services (TCP/IP, UDP, DHCP, DNS). This table shows how the pinout on WiFi 6 click corresponds to the pinout on the mikroBUS™ socket (the latter shown in the two middle columns). This snippet shows how easy it is to connect to the WiFi 6 click and begin communication. 4     //TFT display output initialization. 15     //Initialize BGLIB with our output function for sending messages. 18     //Send a Hello command to verify the serial port is working. Code examples that demonstrate the usage of WiFi 6 click with MikroElektronika hardware, written for mikroC for ARM is available on Libstock.